Among the most difficult concepts for many adult children to understand in a time of need is the difference between Home Health and Home Care, which also is known as Private Duty. Though the program names may sound like they provide the same function and service, there are clear differences that through research and consultation will provide your senior loved one with the level of care that they need. “While every situation is different, the most important thing to know about the next step in Mom or Dad’s life are the questions that need to be asked,” says Julia Pendleton, a social worker with St. Andrews & Bethesda Home Health. Home Health is typically covered by and paid for by Medicare (or Insurance), requires a skilled or nursing need, and is ordered by a physician when someone is recovering from an injury or illness. 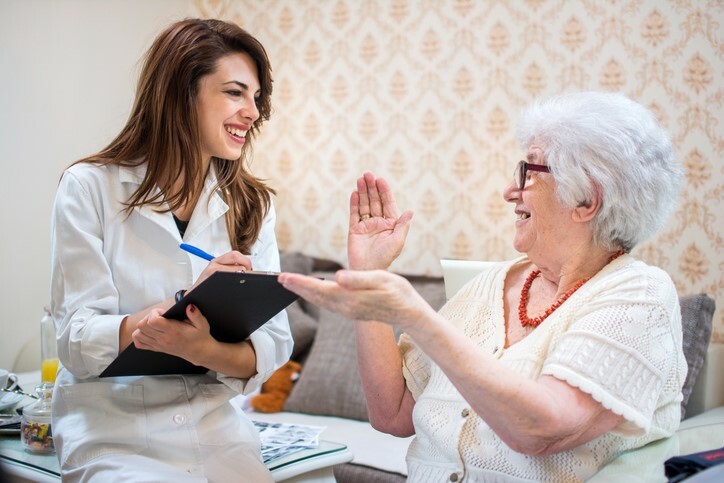 Intermittent and typically short in duration, Home Health services are provided by healthcare professionals, possibly including an RN, LPN, or physical or occupational therapist. Home Care (or Private Duty) is non-medical in nature, can be provided for an extended period of time and offers services that include housekeeping, cooking, medication management, transportation, bathing, dressing, companionship and errands. Typically, this service is privately paid, although it can sometimes be covered by Medicaid, Veteran’s Affairs benefits or long-term care plans. How do I choose a Home Health or Home Care provider? When looking for care options for your senior loved one, use your network of physicians, family and friends for recommendations. The Care Management program at organizations like Bethesda Health Group, whose team includes a Certified Geriatric Care Manager and a Care Coordinator, can provide tremendous assistance as well. What questions should I ask a prospective Home Health agency? If your senior loved one is in need of Home Health services, you should develop a list of questions surrounding the senior’s medical needs and insurance coverage. Asking thorough questions will help you determine the right Home Health agency. Does your agency accept my insurance – Medicare, Medicaid, Advantage Plan, etc.? Will there be any out-of-pocket expenses? Do you provide the services that my physician is recommending for me, and how soon can you start? Do you have staff experienced in dealing with my diagnosis and care needs? How are visits scheduled, and is there flexibility in scheduling? Do you have staff available at night and on weekends for emergencies? What is the procedure for addressing a problem or complaint? What is your agency’s Star Rating? When seeking Home Care services for your senior loved one, you may come across a different list of questions surrounding non-medical care, a designated caregiver and out-of-pocket costs. What services do you offer? Are you able to provide transportation services in addition to in-home services? What is your hourly rate? Are there additional charges for evenings and weekends? What is your hourly minimum? Is 24-hour care available? Do you provide an initial assessment and a written service plan to help guide the caregivers? Is an RN on staff on a 24-hour basis to handle emergencies? What type of experience/certification do the staff caregivers have? How are staff caregivers assigned? Will I typically have the same staff member? What happens if my staff caregiver is sick or does not show up? Does your agency provide a contract for service? Is there a cancellation policy? How does billing work? How long has the agency been in business, and is there a list of agency references available? If you are unsure about the level of care that your senior loved one requires, Bethesda’s Care Management team can help. We can provide recommendations based on your senior’s needs, finances, and location. For those seeking temporary assistance after illness or hospitalization in the greater St. Louis area, contact St. Andrews & Bethesda Home Health to learn more about the Home Health services we provide. If your senior loved one is in need of ongoing Private Duty or Home Care, contact our care professionals to learn more about our Senior Support Solutions services in the St. Louis area.